5 Common Business Contract Mistakes and How to Avoid Them. A business contract is a glue that holds business relationships together. Regardless of the business you have, as long as you are selling any good or service to a paying client or customer, a contract is imperative. However, a few common costly mistakes can sink a bootstrapped business if certain processes are not properly and carefully managed, especially contractual matters. Here are five common contract mistakes often made by businesses, as well as some advice on how to avoid them. 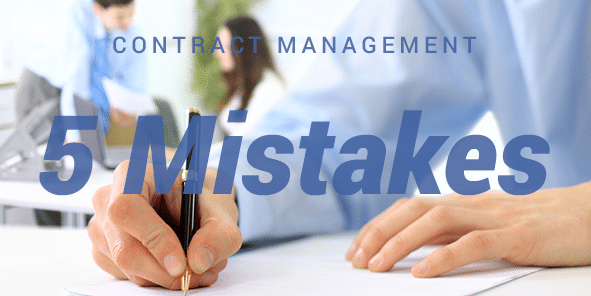 Failing to use a contract: One of the biggest contract mistakes a business owner can make is not using one at all. Relying on a handshake and a promise is not sufficient to ensure adequate protection of a business. This is because a promise may not always be enforceable under the law. Someone who makes a promise can change their mind at any time and leave you without recourse to move forward with the expectations you have for the business transaction Which is exactly why you need a signed contract for any and all business transactions or agreements. Drawing up the contract yourself: You could very probably save a bit of money by simply doing a search online for a contract template and editing it as best as you can to suit the needs you want it for. You can however be certain that a qualified and experienced attorney will likely be able to pick holes in that unprofessionally done contract, which at the end of the day may have unintended consequences. It is exactly for this reason that any contract you sign, or intend to have signed, must be drafted by a qualified and experienced business contract lawyer. Ambiguity: If a contract is open to to multiple interpretations, then it is considered to be “ambiguous.” Contracts not only define the actual details of an arrangement between two parties, they also help ensure that everyone involved is on the same page by defining expectations. Ambiguity can lead to miscommunication and misunderstanding between the contracting parties. Oftentimes, it is ambiguity that gets a contractual dispute that has gone to litigation, thrown out of court. This is why it is important for a contract to use clear and direct language, and be easily understood by all parties to the contract. Omission: Simply leaving out certain aspects or clauses in an agreement is not advisable. It is easy for the inexperienced to leave out certain details that may seem unimportant, but may turn out to be critical to the enforceability of the contract. An attorney is one person who can help ensure that such omissions do not take place. Appropriate dispute resolution mechanism: Most business contracts, particularly the ones drawn up by inexperienced people who are not lawyers, usually fail to consider ways to resolve a dispute should it arise. The whole point of having a contract is to have an agreement that is enforceable under the law. Which is probably why there is no point in having a contract in place if the cost of enforcing it will be prohibitive to your business. This is perhaps where the principle of alternative dispute resolution comes in, as an alternative to litigation.